Surprisingly, after much investment in 4G over the last few years, LTE roaming still represents less than half of all the world’s roaming traffic today. This is what Syniverse found in a new study, and it highlights an area that we’re doing a deep dive into this year. 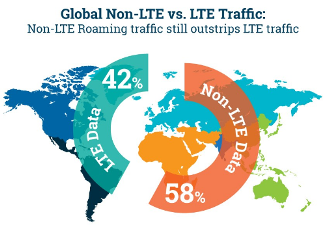 Our study analyzed the regular course, or “trade winds,” of global roaming traffic from more than 1,000 mobile operators, and the findings revealed that inter-regional non-LTE roaming traffic currently outstrips LTE roaming traffic by 58 to 42 percent. Over the past couple of weeks, we’ve gotten a lot of positive feedback and media coverage on the study, and below I would like to share a sample of this in an article by Scott Bicheno of Telecoms.com. The study’s implications open a number of intriguing questions about the challenges and opportunities for the maturity of LTE that we’re looking forward to providing more insights on soon. This article was originally published in Telecoms.com and is republished here with permission. Mobile transaction processor Syniverse has tapped its own data reserves to uncover the fact that, even now, only 42% of inter-regional data roaming is LTE. Mary Clark, CMO of Syniverse, told us in a briefing at MWC 2017 that she thinks operators are missing a major trick here because inbound roaming is just easy cash straight onto the bottom line without having to do much to earn it. What’s not to like? When you put it like that it’s remarkable that operators are still dragging their feet on this stuff, when all they need to do is make a decision to prioritise roaming. It seems that operators simply aren’t aware what a good opportunity this is, which is why Syniverse conducted this analysis of global roaming traffic from across its customer base of over 1,000 mobile operators. The analysis revealed the vast majority of inter-regional LTE roaming occurs between North and Latin America, which makes you wonder what Europe, Africa and Asia are up to. Having said that your correspondent is roaming from EE in the UK to Orange in Spain and it’s been 4G nearly all the way. This looks like a license to print money and, while Syniverse doubtless has a commercial interest in helping to improve LTE roaming, there doesn’t seem to be much potential downside for operators. The majority of roaming consumers are still paying a premium to be disappointed – that doesn’t sound like good business to us. John, I haven’t had the chance to look in detail at your survey but you do raise a really interesting point about inter-regional roaming traffic. We are now seeing the dismantling of the roaming regime in Europe and other regions (Middle East, Greater China etc) will follow to a greater or lesser degree. This has an immediate short term impact on the revenues of roaming operators and their natural response is to protect / increase charges for inter-region roaming. I do not believe that operators have confidence in pricing elasticity for such traffic / routes. Now, I appreciate that your study is looking specifically at LTE but I do think that there is a link here. If LTE roaming routes were opened up and roaming was priced attractively, we would see an explosion of inter-region roaming. Of course, the other angle here is that for many operators inbound roaming is a massive contributor to the bottom line. Until they are convinced of arguments around pricing elasticity they will seek to protect what they already have in terms of traffic and (IOT) pricing. My own view is that the inter-regional roaming regime will break down as and when large operator groups work together to zero-rate traffic from each others’ customers. This will have a domino effect on the industry as a whole.